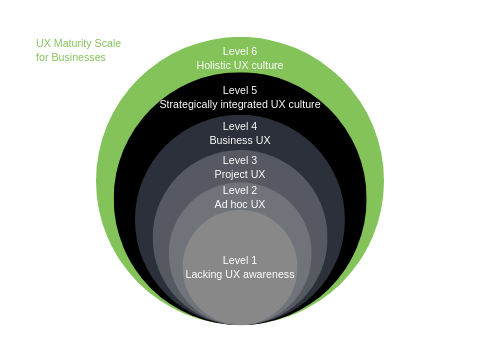 TestingTime » UX Blog » The 6 degrees of the UX maturity scale – How UX-ready is your company? 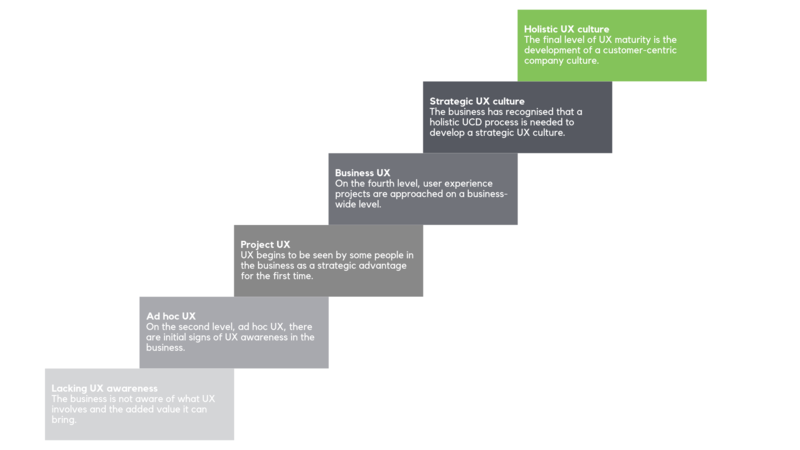 The 6 degrees of the UX maturity scale – How UX-ready is your company? If you'd like to establish a UX mentality in your business, it's helpful first of all to assess your current situation. In this article, you'll find out how to classify the UX maturity level or user focus of your business yourself and how you can develop your internal UX practices. The typical company undergoes gradual growth towards user focus as its own UX processes slowly develop and mature. This gradual development often takes place in the same sequence. So we can use so-called UX maturity models as a guide. These help us to classify our businesses and define what is necessary to reach the next level. First of all, read the following descriptions of the six levels. Then try to classify your business and understand what you need to reach the next UX maturity level. On the lowest maturity level, the business is not aware of what UX involves and the added value it can bring. On this UX maturity level, the functionality of the product is the main focus. Developers don’t want to know anything about users and their needs. However, lacking UX awareness poses a risk. After all, users of apps and websites have become accustomed to a good user experience and may feel alienated by applications which are difficult to use. 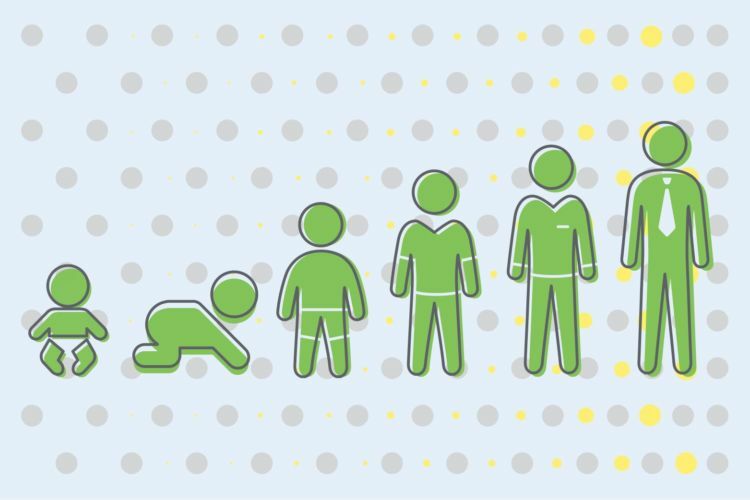 Younger customer groups in particular have a heightened awareness of reduced usability. Decreasing user numbers and increasing support costs are the unavoidable consequences of this. The topic of UX doesn’t come up and the UI is mostly shaped by developers. What you can do: On this level, it’s very hard to make user experience a topic of discussion, as thus far none of those involved have recognised lacking usability and UX as a problem. Negative customer feedback or decreasing user numbers will also eventually make it clear to the company management or a team leader that lacking usability may play a role – and you can move onto the second level. On the second level, ad hoc UX, there are initial signs of UX awareness in the business. Someone from company management may, for example, have heard about the benefits of a good user experience at a conference for the first time. Or an employee discovers the philosophy that places users at the centre and tries to find support within the business by presenting the advantages of UX to their team. In this early phase, some initial designers (or teams) might attempt to recruit a handful of subjects for a simple user test or an external usability consultant is called in for an expert review. It is likely that these initial UX efforts fail miserably or peter out, as most businesses on the second maturity level don’t have the required skills and experience to integrate UX into existing processes successfully. On this level, it’s possible that the business has neither provided a standalone UX budget nor hired a dedicated UX designer. UX is not seen as an autonomous discipline. Instead, UX and user research activities are conducted on an ad hoc basis and are dependent on individuals’ initiatives. The designers on this level also lack the necessary internal authority to implement consistent user-focused activities. The lack of these skills, combined with limited resources and an absence of internal support, means that UX cannot be pursued and practised fully. The topic of UX comes up within the company, but it is implemented very inconsistently. What you can do: On this level, it&’s important that you document all results and all design improvements of your UX work and ideally are able to present conclusive ‘before and after’ comparisons of your UX activities. Make these documents publicly available or send them to your team colleagues and supervisors. It’s likely that this will lead some people in the business to begin to understand the logic and benefits of a good user experience. These people will also show readiness to move up with you to the third maturity level – the project-based UX. Levels 1 and 2 are &’pre-UX’ maturity levels. With maturity level 3, UX starts to become an entrenched aspect of the development process and UX begins to be seen by some people in the business as a strategic advantage for the first time. This often happens if small ad hoc UX projects enjoy initial visible successes, attracting the attention of supervisors or company management. Through these user-focused projects, the business recognises the value of UX and decides to consistently incorporate customer focus into new projects. This is an important step, as UX and usability practices on this level are finally allocated a dedicated budget. The first formal UX processes are introduced and, depending on the budget, a UX project team is formed with existing designers or – in bigger businesses – dedicated UX designers and UX researchers are hired to form their own department. On this level, UX is often seen as a magic tool to polish up UIs. The problem is that usually only UIs and product features are tested in the end stage of product development using simple user tests, without user research, needfinding or prototyping taking place in advance. The later in the development process that problems are discovered, the less likely it is that they will be dealt with, for reasons of cost. Projects are allocated dedicated UX budgets and designers, but there is still no business-wide integration. What you can do: Now you have your own UX budget. And you need to defend it and be able to show the ROI of your user experience activities. This takes time. 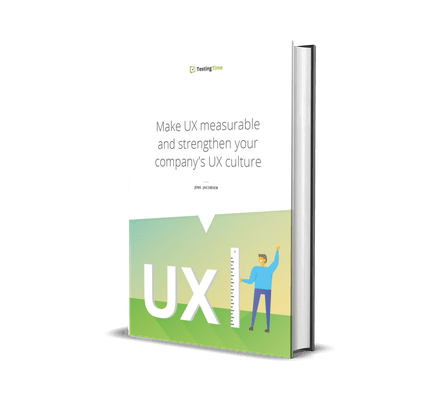 You need ongoing success stories that prove your UX activities result in higher conversion rates or fewer support queries or improve other important internal metrics. This means that you must measure all improvements in user experience over the entire customer journey. Eventually, you will have enough in your arsenal to move up to the fourth level: Business UX. On the fourth level, user experience projects are approached on a business-wide level. UX is now no longer an independent support function. Instead, it is represented by an official UX team led by a UX manager. The UX manager analyses the business’s holistic, cross-project user experience first of all. They have a key position when it comes to maintaining and promoting the customer-centric approach. Their most important task is leading the UX team in such a way that consistent processes result in high design quality and good usability, which are not seen as a side product of chance and talent. On this level, projects with internal interdependencies and independent projects are viewed in a business context. That means the link between them is observed. Although the introduction of a mobile online store app, for example, was set up as an independent project, on this level it is recognised that the new app impacts many business processes. Accordingly, the customer support team will have to help users deal with their problems with the app. Or shipping want to know which products need to be sent to which customers, and how. And, last but not least, accounting must be able to deal with the financial aspects of app transactions. All these points contribute to the customer or user’s positive user experience. However, the risk on this level is that the different internal departments don’t get the information they need to be able to guarantee a good user experience. This opens the door to misunderstandings, inefficiencies and errors. UX processes are consistently integrated into the product development cycle. What you can do: Recognise interdependencies between departments and all potential customer touchpoints. This makes it possible to develop a strategic UX method. However, before a company reaches level 5, business processes need to be adapted and all stakeholders must be involved in the discussions in order to deal with their reservations early on and get them on board the UX train. On level 5, the business has recognised that a holistic user centred design (UCD) process is needed to develop a strategic UX culture. Before initial design work can begin, user research is carried out for important projects as early as the initial stage. Companies with strategic UX cultures have often developed internal design systems and built pattern libraries. This guarantees a uniform design vocabulary across all channels. The management has also most likely set up KPIs to measure and monitor the quality of the user experience. If projects do not meet internal UX standards, they are stopped and the product is improved before it reaches the customer. On this level, a truly iterative design process is also pursued for the first time. The company realises that better products are made when there are several rounds of design feedback. Products are tested and refined – using both low-fi paper mockups and clickable pixel-precise prototypes. In the best scenarios, companies on this level already begin with field studies and needfinding. This means that users are already involved in the project definition stage. The company pursues an iterative design process which comprises several rounds of prototyping and advanced user testing. User research and initial needfinding take place in increasingly early stages of project development. What you can do: Reaching the next and final level can often take years. Your aim must be to convince managers and team members in every department that UX and user research is an important part of their work. It is no longer about increasing usability budgets. It is about spreading the UCD approach gradually through the entire company and across departments. The final level of UX maturity – UX nirvana, so to speak – is the development of a customer-centric company culture. On level 6, UX design becomes a key aspect of how a business thinks and acts. Every member of staff – from the CEO to the intern – is aware of the significance of user experience. A fundamental value of these companies is that every employee considers the customer experience in their work. Every employee should seek ways to integrate and improve it on every level. This kind of ‘enlightenment’ brings numerous benefits with it. These businesses are agile, customer-centric and have well-considered internal processes. And accordingly they have an immense advantage in bringing innovative products onto the market more quickly. The basis for all of this is the in-depth knowledge of the customer’s perspective and a genuine interest in it. The user experience is part of a business-wide strategy and the development of products for human end users follows the UX design process. How can you use this UX maturity scale? Read through the five levels of the UX maturity scale at your leisure and try to work out how it relates to your business. Where do you find yourselves now? What do you still need in order to move up to the next level? Based on these questions, you can put together an action plan that helps you fill in the gaps preventing you from working in a more effective customer-centric way. Why is the UX maturity scale relevant to me? Today, a company needs to be able to react to market changes quickly and effectively. Product development cycles are getting shorter and continuing innovation is now crucial for every business that wants to stay relevant. The industry is learning that striving for success in the digital age requires new paths. The right measures need to be identified and implemented. If a business wishes to stay agile and innovative today, user experience and customer experience are key. A business can only stay relevant in the longer term if it understands where customers stand. Which problems do they have and what are their major needs? You must, therefore, aim to understand where your business stands today. Only in this way can you take the right initiatives and clear the path of obstacles to promote and broaden understanding of user experience in your business.